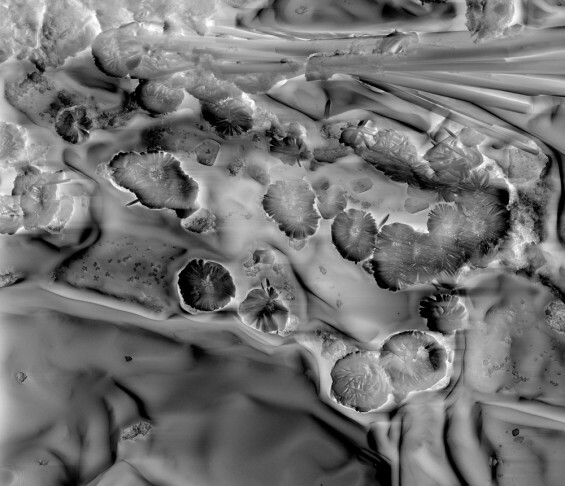 Monet [Un]Masked was made with a scanning electron microscope (SEM) of crystals, home grown by the artist. The depth and three dimensions achieved in the SEM sets this imaging process apart from photography where images are created by photons (particles of light) rather than by electrons (electrically charged particles). The electrons penetrate deeper inside the structure creating images with more depth, more natural 3D-look than the photographic images. Nano Art, Invisible Visual Art. Nano Art could be for the 21st Century what photography was for the 20th Century. Buckminster Fuller has often been cited as the grandfather of Nano Art, having foreseen the shapes and molecular structures of the nano-world in his geodesic domes, a.k.a. “buckyballs”, which had such a tectonic impact on architecture and art in the mid-20th century.